Denise Kimbrough is a frequent friendly-face in C-Club. Photo by Chloe Sell. Speak to any senior about Miss Denise from C-Club, and they will know immediately who you are talking about. 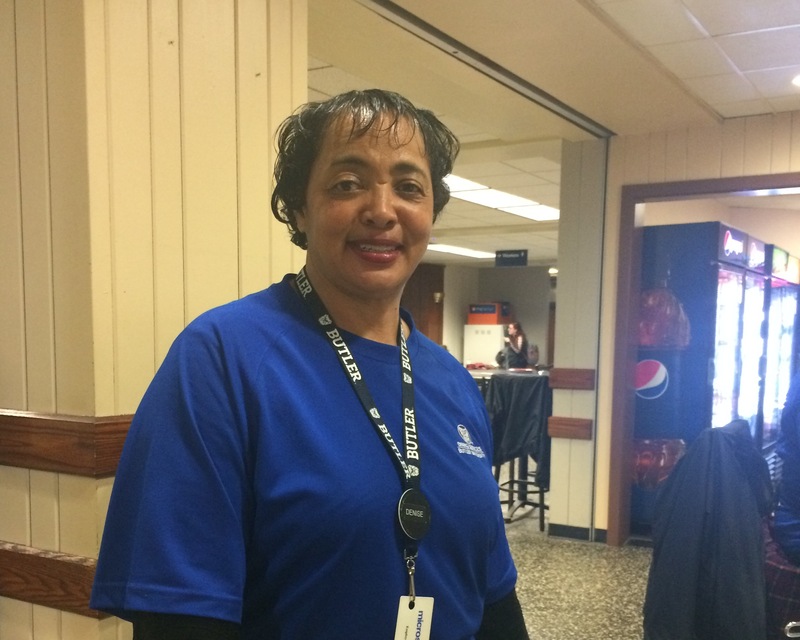 But for first-year and non-Butler students who are not as familiar, Denise Kimbrough has been an Aramark employee at Butler University for seven years. Kimbrough works as a cashier at Atherton Union’s C-Club. Kimbrough has had some trials, such as becoming pregnant at 19 and losing several family members, but she said she is so strong-willed because of her father. Her father was from Pulaski, Tennessee. He was in sixth grade when he dropped out of school and worked for what is now called the Navistar International manufacturing company. He worked there for more than 10 years before he decided he wanted his own business, a trash collecting service. When her brother and father died around the same time, there was no one to help Kimbrough with the family business, so she tried for a year or so to manage it by herself. But it became too difficult. She lived close to Butler at the time and had the idea to work on campus. But that little job has a big impact on a lot of people. Kimbrough’s fellow co-worker Farrah Smith has known her for five years and said they are close. Camara Wallace, a second year English Masters in Fine Arts student, met Kimbrough in 2016. When Kimbrough was 19 and about to go to college on a scholarship, one of her brothers died in a motorcycle accident. This was a month before she found out she was pregnant. Her parents said they would take care of the baby. The father of her child said he wanted nothing to do with his kid. She never reconciled with her son’s father. Instead, she has a partner, one who has asked her to marry him several times. She said that she has always refused him because she has seen her brother’s bad marriage first-hand and didn’t want her marriage to be like that. Kimbrough will be 58 this year, and that number is just fine with her. She said a few black students have told her it would be their last year at Butler because they thought the campus was prejudiced. These students look to Kimbrough for advice. She used to experience racism a few years ago. The first year she was at Butler, some students did not want to touch her hand as she gave them back their change. A few white men in a truck on Sunset Avenue called her the n-word as they were driving by. To that, she waved and said hello. “When people call you out of your name, you know, you just smile and say ‘What are you?’” Kimbrough said. Wallace said Kimbrough is very supportive of Butler students, especially those of color. Wallace is black. She compared Kimbrough to a cheerleader, saying she knew she was always rooting for her, which goes above and beyond the role of a cashier. The fact that there is a racial disparity between the Aramark workers and the majority of the students only makes Kimbrough’s happy attitude more important and unique, Wallace said. Kimbrough said the best part about her job is interacting with students.